← Dissertation Blog entry #4. Survey day 3. 2013. Dissertation Blog entry #5. Survey days 4 & 5. 2013. I returned to Hale Golf Course for a second day. It poured with rain as I cycled there. Shower rain like in films. I was soaked within minutes. I stood dripping in the petrol station waiting to pay for a bag of Skittles while a man had an argument with the guy on the til. He’d forgotten his wallet and only realised after putting £5 of petrol in his van. The man behind the til wouldn’t accept his trader’s license and mobile phone as collateral as it wasn’t company policy. The man got angrier and angrier. Then another man gave him £5 and he left. I was 10p short for my Skittles. I didn’t bother asking if they’d let me off. As luck would have it they were 10p cheaper at the next garage I stopped at. Hooray! I arrived at the golf course and was locking my bike up when a man called Richard who described himself as ‘one of the pros’ introduced himself and asked me to lock it up round the back instead. I told him what I was doing there and he took my details to give to a man who apparently does a lot of conservation work on the site. Hale Golf Club seem very interested in the control of invasive plant species. I headed into the woods and performed a quick change into a dry t-shirt and cagoule, managing to achieve it without encountering any dog walkers, and headed into the woods, further off the path this time to complete 4 more woodland quadrats. Despite the weather this proved to be a really enjoyable session. I felt quite alone for most of the time, it was lovely and lush and green. Occasionally I’d hear a dog bark in the distance and stop what I was doing, several Balsam stems in hand and see if I could see anyone. It occurred to me I must look almost Hobbit like foraging around in the woods on my own. Hopefully Hobbit like, not Golum like. 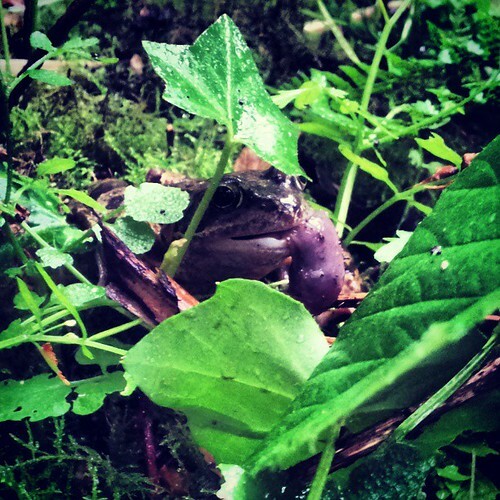 Just as I was leaving I was treated to the site of a big, healthy looking Common Frog hopping through the vegetation. It hopped right up to a juicy slug and proceeded to eat it on the hop, one half hanging out of it’s wide mouth. This may have been partly due to me trying to take a photo of it which in the end I gave up on the perfect shot and settled for just watching. 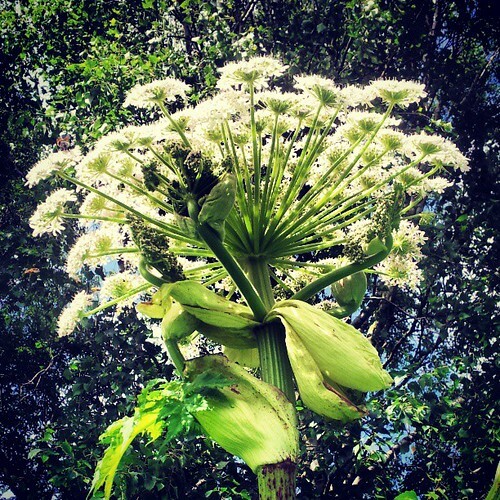 My first Giant Hogweed day. This presented an exciting variation to the surveys thus far and an extra hassle. 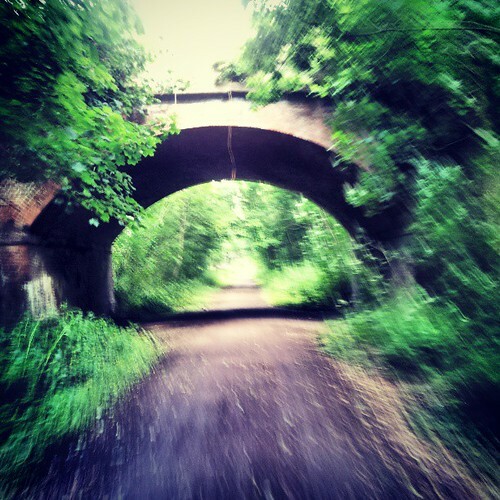 I had to cycle the 12ish miles to Geoffrey’s house with all my usual kit, plus wellies. Wellies are both big and heavy. You may not notice it when you’re slinging them in the boot of your car but trust me they’re a right pain to get in a bag on your back. I had to load myself up with my backpacking rucksack on my back. It was heavy and cumbersome and hurt my back to cycle with on. After a few miles I discovered if I undid the waist strap it wasn’t so bad and I got my head down and dealt with the journey one miles stone at a time. I caught my breath and had my lunch in a field near Geoffrey’s house so arrived on time in good spirits. Sal was there too with overalls, gloves and a visor to borrow to protect me from the phototoxic chemicals in the plant’s sap which I’ve just read can get into the nucleus of the epithilial cells, forming a bond with the DNA, causing the cells to die. 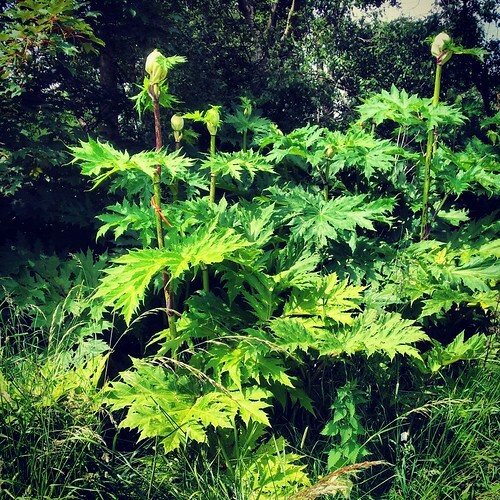 Google ‘giant hogweed burns’ and check out the images if you’re aren’t familiar with what this plant can do to you. Geoffrey took some photos of Sal and I for an article he’s writing. I asked him to take the above photo for my blog. I think it looks a little bit like I’ve superimposed Sal onto it but I assure you she was there. I was left to get on on with it. The sun had come out for another beautiful afternoon. 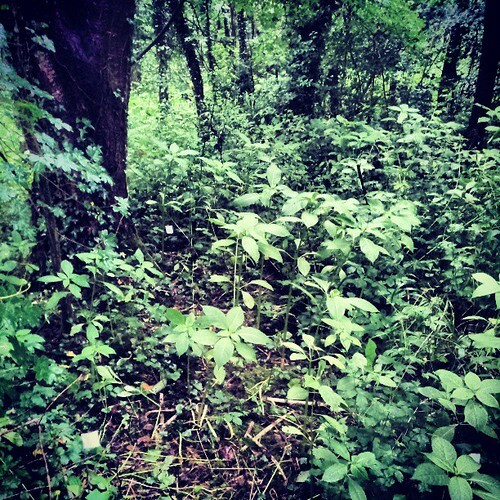 I marked out my plots, all of them starting at the boundary of meadow and Hogweed extending 2m into the Hogweed stands. 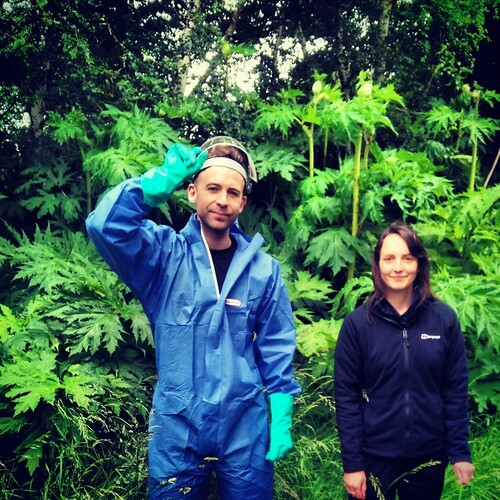 I took my GPS readings, wrote my descriptions etc etc, then I fastened my hood, pulled up my gloves and down my visor and I crawled into the Giant Hogweed. Two things were immediately both obvious and surprising. Firstly there was nothing growing within the Giant Hogweed. 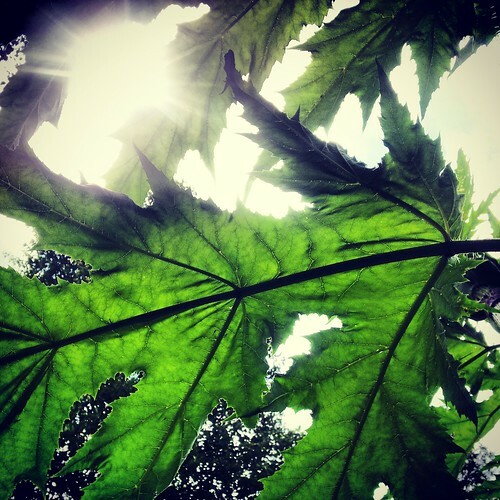 There was the odd bramble and some grasses near the edge but between the stems, under the canopy formed by those huge serrated leaves it was a desert. Second, the smell. It smelt gorgeous in there! Like almonds or something it was one of those smells you like so much you keep taking deep breaths through your nose to get more of it. How cruel a trick of nature that something so toxic could smell so inviting. No one had told me about the smell. 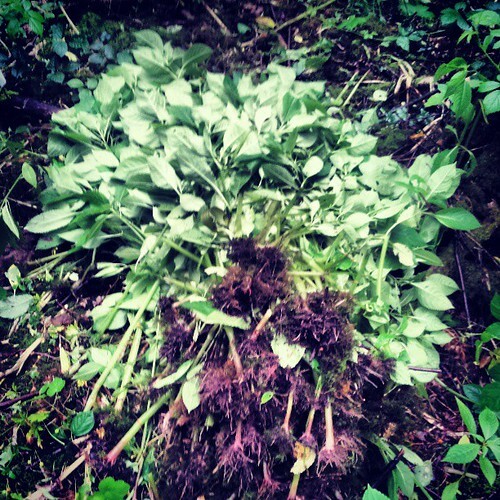 I’m pretty sure it was coming from the Giant Hogweed because it smelt good in all 5 plots I surveyed. There doesn’t seem to be much on line about it’s aroma and Stace makes no mention of it. 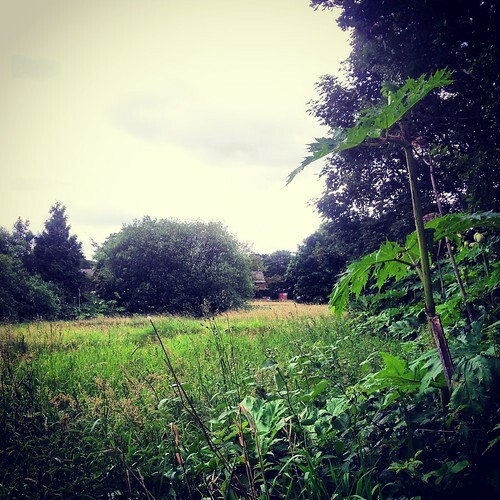 As I pottered about on my own in the meadow wearing my blue overalls and visor I felt like a character in some post apocalyptic science fiction novel wandering through a deserted and beautiful wilderness. Banded and Emerald damselflies flew up from the grass and darted around me as I moved around, attempting to give them plenty of time to escape my wellington boots with slow steps. Sal will arrange for the Giant Hogweed to be removed from my plots, so the 5 I surveyed didn’t take too long and I was ready to leave by 4pm. I waded through the long grass of the meadow back to the house to get my bike. Dougie the dog barked at me and I congratulated him on being a good guard dog. It’d been a great day getting so close to these poisonous giants, able to move among them with their leaves brushing off my visor an their huge, hollow stems crunching with almost larynx like tones beneath my feet. They are so impressive. 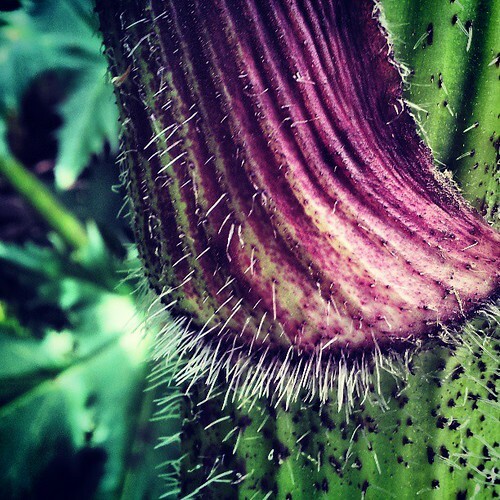 Their flower pods look like cabbages atop 10ft poles and the flowers were covered in bees looting their pollen. But however beautiful and interesting, they are unmistakable invaders. On first seeing the stand of them in the meadow I commented that there is nothing British about them. 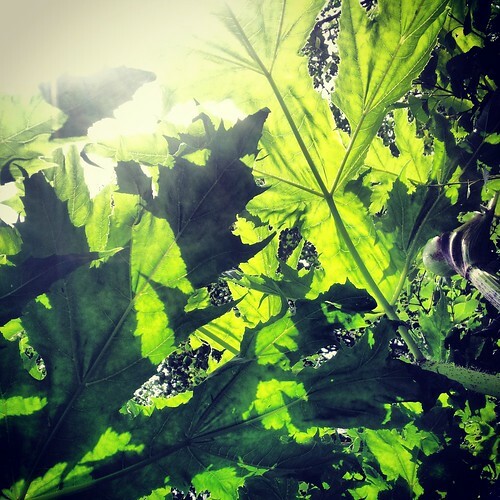 Their form and size, everything about them screams intruder and if you climb through the stand of them to the river bank you see Giant Hogweed stretching along the river bank off into the distance. Thousands of plants, presumably with the same silent, shaded desert stretching along beneath them. I put on my pack and headed home. As I turned onto the 62 cycle route it occurred to me I knew the way so no need to Google Maps directing me through my headphones. I put Freebird by Lynyrd Skynyd on and fired down the path in the sunshine. Insects bounced off my face and as the guitars kicked in swallows were darting back and forth across the path.